“Ethiopian food is bland. I don’t know why people get excited over”. These were the remarks of a good friend of mine when we were discussing Ethiopian food. Being from Kenya, I trusted his opinion but I thought “I still have to try it myself”. Luckily the opportunity presented itself. While looking for places to explore in Joburg, I stumbled upon the restaurants in Maboneng Precinct. Once of which was an Ethiopian restaurant, James XIV Ethiopian Restaurant. Looking at only the pictures of the Ethiopian coffee, I made it my mission to eat at this restaurant. James XIV is located on the less busy side of the precinct and opposite the Museum of African Design. It’s quite small inside, with a kitchen a few tables. Luckily there’s tables outside, allowing you to enjoy the warmth of winter sun. Arriving inside the cafe, the friendly owner met us at the counter and allowed us to grab any table we wanted. We were the only ones there, so we had plenty of options. We picked a table outside and once seated, a cook/waiter appeared to take our order without a menu. We started at her, she stared at us and eventually we asked if they had a menu. The cook/waiter was shocked! Why were we asking for a menu? There were only 2 options available, so a menu was not required. The 2 options were: vegetable or vegetable and meat. We ordered 2 portions of vegetables and meat for the 3 of us. The food arrived approximately 10 minutes later, on a huge silver tray. In the tray was injera (an East African flatbread made from sour-dough). On the injera was an array of wat (stew). As injera is the national food of Ethiopia, I couldn’t wait to tuck in. 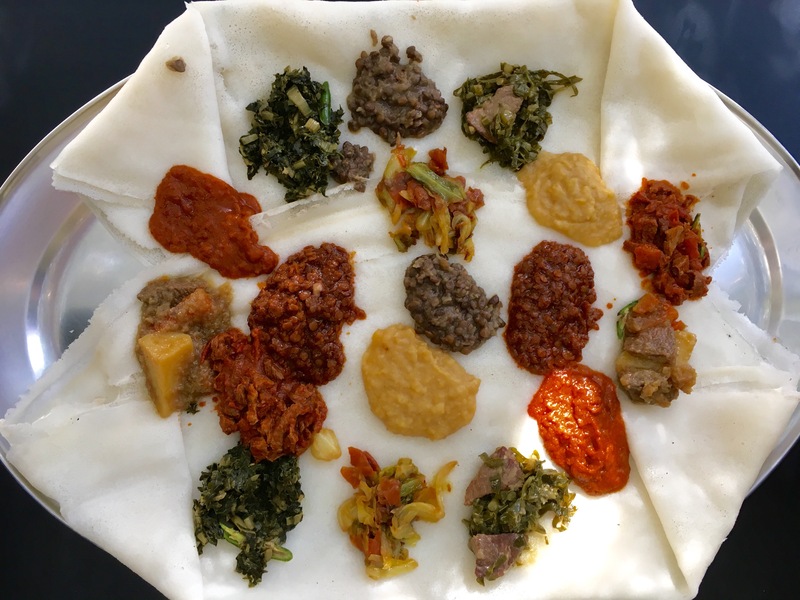 Injera has a sponge texture and was tasteless, which is understandable given that each wat had a unique flavour. Shiro is the red sauce that is made of chickpea powder. The powder is slow-cooked with Ethiopian red berbere sauce. The shiro was delicious and spicy. I couldn’t help each a whole portion on my own. Azifa is the brown looking lentils. This is actually a salad made from cooked green lentils, chili, mustard seeds, onion and lemon juice. Given the amount of spices and chili I found it bland. Kik alicha is the yellow lentils on the plate. Split peas are cooked with plenty of healthy turmeric, chili and garlic. This was my favourite wat as it was spicy and full of garlic. But not so much garlic to keep the vampires at bay. The red lentils are mesir wot, which is split red lentils cooked in berbere sauce, with onions and garlic. This was also spicy but not as tasty as kik alicha. Gomen is collard greens that were served with beef. Gomen is made with onions, garlic, lemon juice, tumeric, paprika, ginger root, and ground allspice. Collard greens are normally bland but the meat was tasty and tender. On the plate was also atkilt wot, which is a combination of cabbage, carrots and potatoes. These vegetables are simmered in a turmeric and cumin sauce. I’m not a fan of cabbage but the atkilt wot was delicious. Included in the wat was spinach, braised with onion, chili and garlic. This tasted identical to my granny’s cooking, which is spicy and warming. The spicy beef was made with red berbere sauce. It was indeed spicy and left you reaching for your water. The wat was delicious as well and accompanied the injera well. I can’t think of anything else to eat with the beef besides the injera. The potatoes and carrots stew was also delicious. I enjoyed the gravy more as I found the potato a bit hard. 2 portions were a lot for the 3 of us but the food was delicious. So delicious that we cleaned the plate. After that spicy affair was the pierce de resistance: Ethiopian coffee. 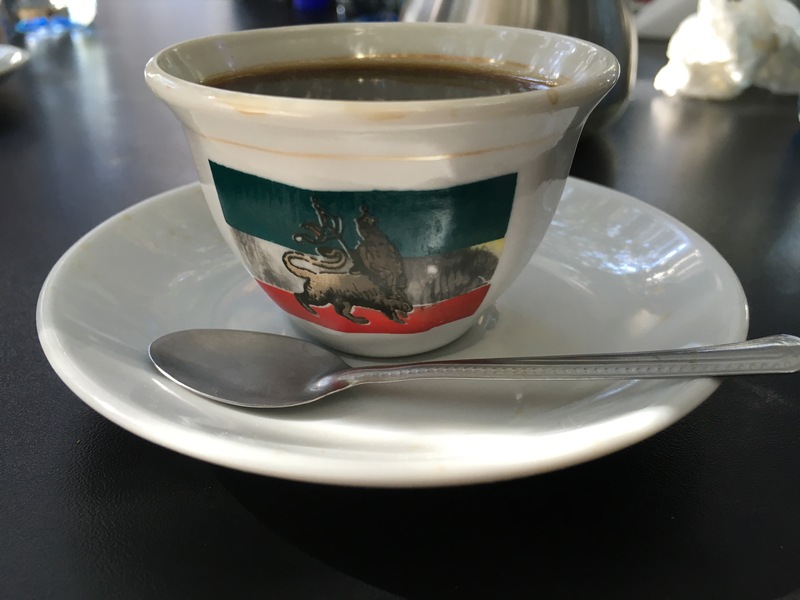 My Kenyan friend may dislike Ethiopian food but he had only good things to say about their coffee. It is well-known that coffee originated from Ethiopia and has a significant impact on the Ethiopian economy. It’s also the country’s national beverage. I was looking forward to seeing the coffee ceremony but that did not happen. 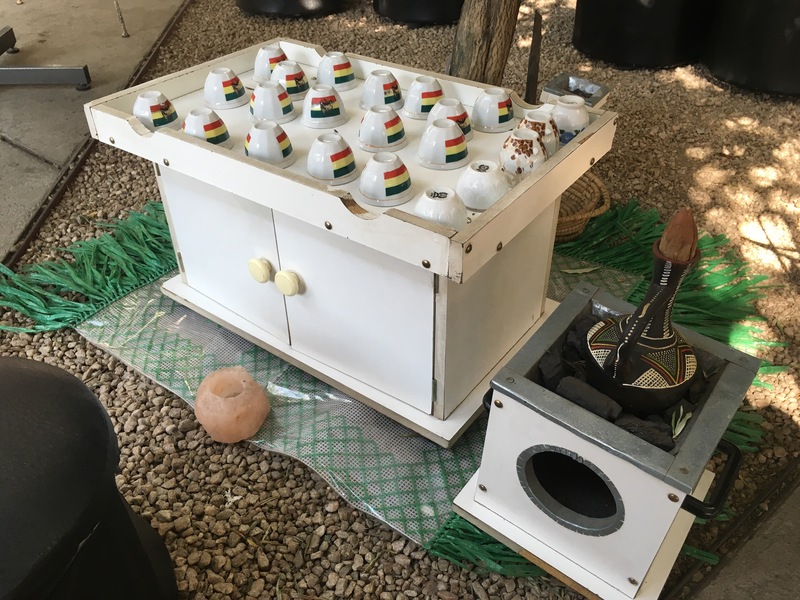 However, I was assured that the coffee was made the traditional way of boiling the coffee in a clay pot. Nonetheless, the coffee was great! It had a strong caffeine smell, so I was a bit hesitant as first, but once I had my first sip I enjoyed every second. The coffee was complex and had a chocolate taste. I enjoyed my first experience of Ethiopian cuisine and can’t wait to have more. Given that James XIV was a small cafe, I felt welcomed and treated well. The food was delicious and the coffee great. Sitting outside, under the trees and almost on the side of the road, did not feel like I was in the middle of Joburg but rather somewhere else. I love it when restaurants manage to transport you away. And James XIV did that without even trying. 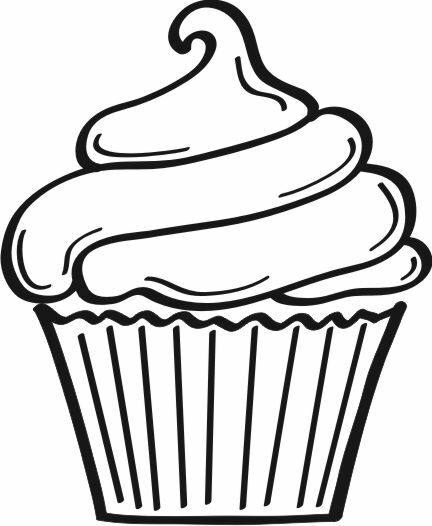 I give James XIV Ethiopian Restaurant 2.5 cupcakes. Enter your email address to follow Tacovolution and receive notifications of new posts by email.